GALION — The Galion school board celebrated the accomplishments of students and the district’s food service operations at Tuesday’s regular meeting. Galion High School Art students David Harper, Haley Phelps and Ryan Utz were recognized for their participation in the North Central State College Foundation “Arts for Success” event at the Crawford Success Center in March. Each student donated their artwork for a silent auction that raised more than $25,000 for local scholarships. The district’s Food Service Department at Galion High School, Middle School, Intermediate School, and Primary School, as well as the Galion Booster Club’s Football and High School Concessions operations were recognized for receiving the Clean Plate Award from the Galion City Health Department for 2018. The Clean Plate Award program was established in 2014 to recognize Galion food service operations and retail food establishments that consistently demonstrate a commitment to protecting the public’s health. The board then heard a presentation from students, staff and parents from the Galion Primary School about the many successes being experienced in the building during the 2018-2019 school year. The board accepted donations totaling more than $10,000 from the Softball Parents’ Club, Wrestling Parents’ Club and Walter R. Hessenhauer Foundation during the meeting. The parents’ club donations will be used to purchase new uniforms, and the funds from the Hessenauer Foundation will be used to purchase new league championship banners and a Clavinova Console Digital Piano for the district’s Music Programs. All other agenda items were approved during the meeting. The board recessed to executive session to consider the purchase or sale of public property if the public interest would be hurt by the premature disclosure of the information and prepare for, conduct, or review negotiations or bargaining sessions with public employees. No additional board action was taken following the executive session. 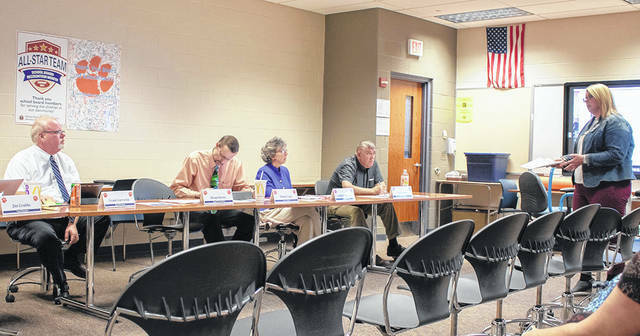 The next regular meeting school board meeting starts at 6:30 p.m. in the Galion Middle School computer lab on May 21. Courtesy photo Success Center operations manager Amanda Sheets shares information Tuesday about the Arts for Success fundraiser involving Galion High School Art students. https://www.galioninquirer.com/wp-content/uploads/sites/38/2019/04/web1_galion-boe-april-2019-1.jpgCourtesy photo Success Center operations manager Amanda Sheets shares information Tuesday about the Arts for Success fundraiser involving Galion High School Art students.